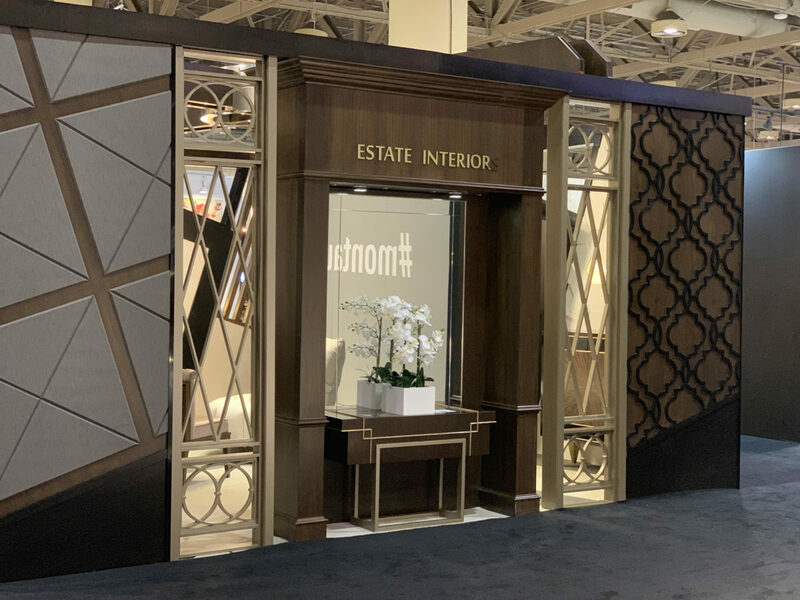 We were asked to help create a one-of-a-kind booth for the 2019 Interior Design Show in Toronto. 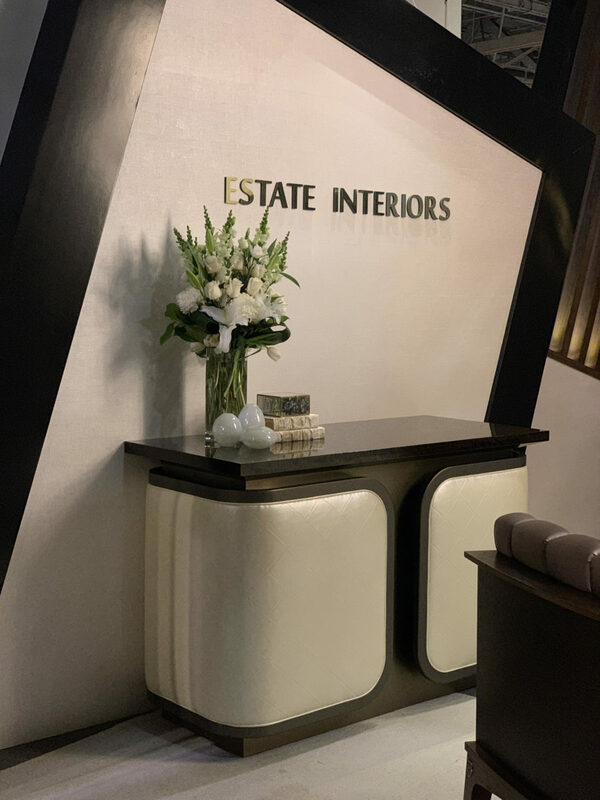 Actually, Frank Manno the genius behind the company, Estate Interiors instructed us to, “Dream up your wildest, most difficult idea for a booth, and we’ll build it”. The outside of the booth shows off furniture and various screen applications. His company manufactures and fabricates environments for designers, specifiers, and architects. The booth had to show off the different finishes and products his company creates with, and for designers. We would need to incorporate everything from intricate, one-of-a-kind, three-dimensional screens, to sensational soft furnishings and beautifully detailed case goods. “A man who has no imagination has no wings” – Muhammad Ali. A Tiny Fun House Complete with Wings! We made a paper model of the booth so we could see what it would look like in three dimensions. 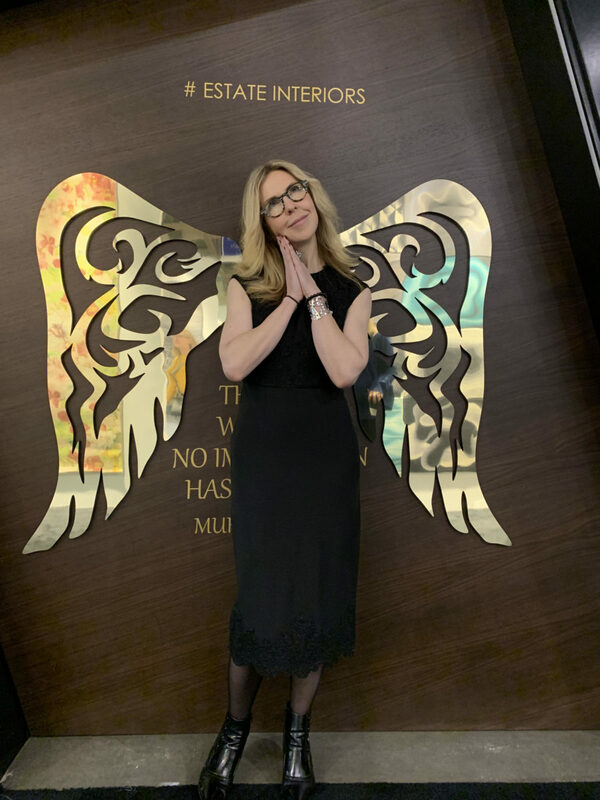 It looked a bit like a tiny fun house—complete with wings! Then, for weeks it started coming to life. First, the 20′ x 20′ skeleton of a room began to take shape. Pillars, walls and three-dimensional shapes were expertly veneered, and finished, ready to be attached. 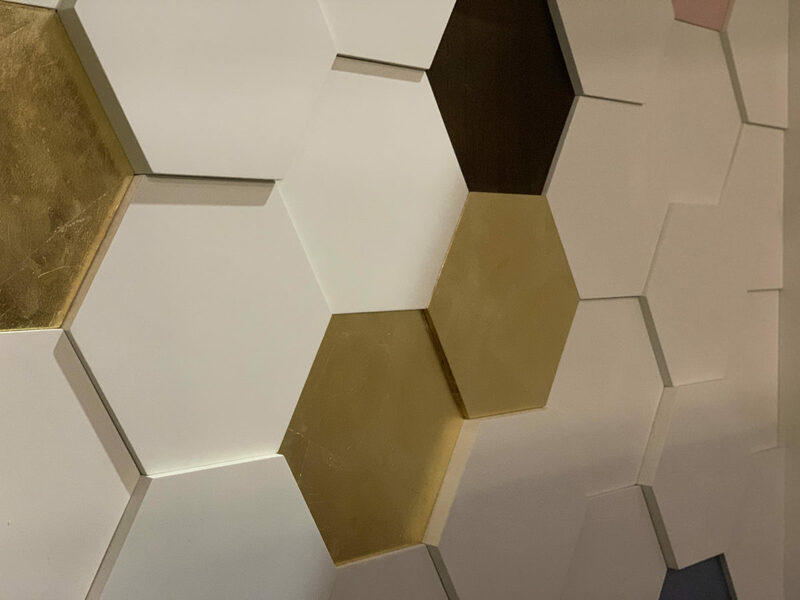 But like any big project that takes a lot of time we never saw it completely finished—that is, until it was installed at the 2019 Interior Design Show. Once in place, the booth was a triumph in compound angles. One section had two angled beams intersect to create a third plane. Materials like exotic wood veneers of Eucalyptus Fumed and Ebony Macassar were incorporated. Veneers are an excellent, flexible material so patterns can be book-matched or straight grained. A curved walnut console clad in vinyl. Estate Interiors created a 3D process to design intricate screens. Any scrollwork pattern can be made into a stand-alone screen from medium density fibreboard. It costs less than fabricating metal and looks just as amazing. As for the furnishings, we dreamed up and drew out our wildest ideas. The curved, channel backed settee in a walnut frame was exquisite. Estate Interiors brought each piece to life from planning to installation. The outside walls and doorways were designed to lure you in for an immersive experience. Inside you could walk around and touch everything, or sit and look around. Traditional wainscoting, crown molding and baseboards were offset by our take on modern architecture. Every surface was covered in different treatments, but the dominating force was a light fixture centred over the bench. It featured shapely plexiglass lighting formed into a futuristic chandelier. 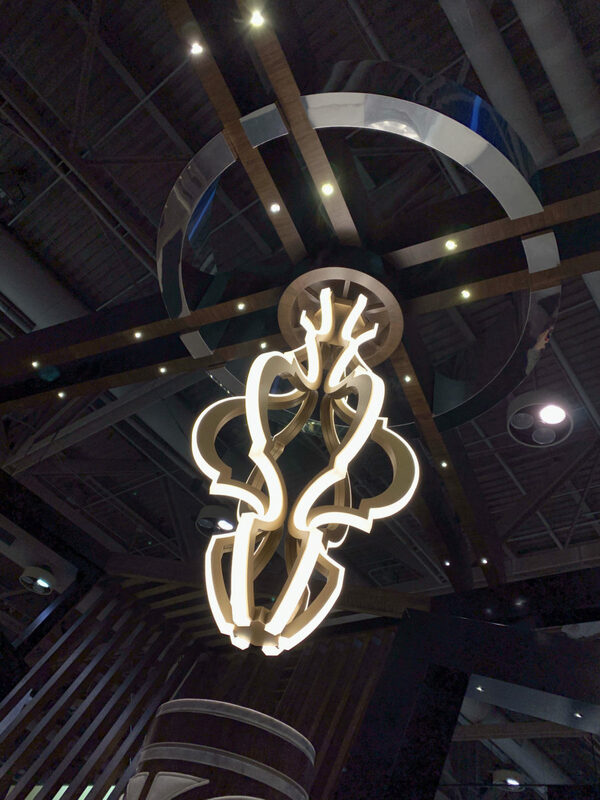 This modern, architectural chandelier was fabricated from plexiglass. Designing a booth is a different experience because create rooms that are meant to stay in one place. A show booth has to be designed to come apart, travel and be rebuilt without damaging anything so problems can arise when you move an intricately designed exhibit and a big show like this year’s Interior Design Show also had multiple exhibits getting moved in and out. As complicated as it was to put up, it had to be disassembled and shipped out again. Like an instant city that suddenly disappears. The Estate Interiors booth will make its next appearance in New York at the International Contemporary Furniture Fair in May.